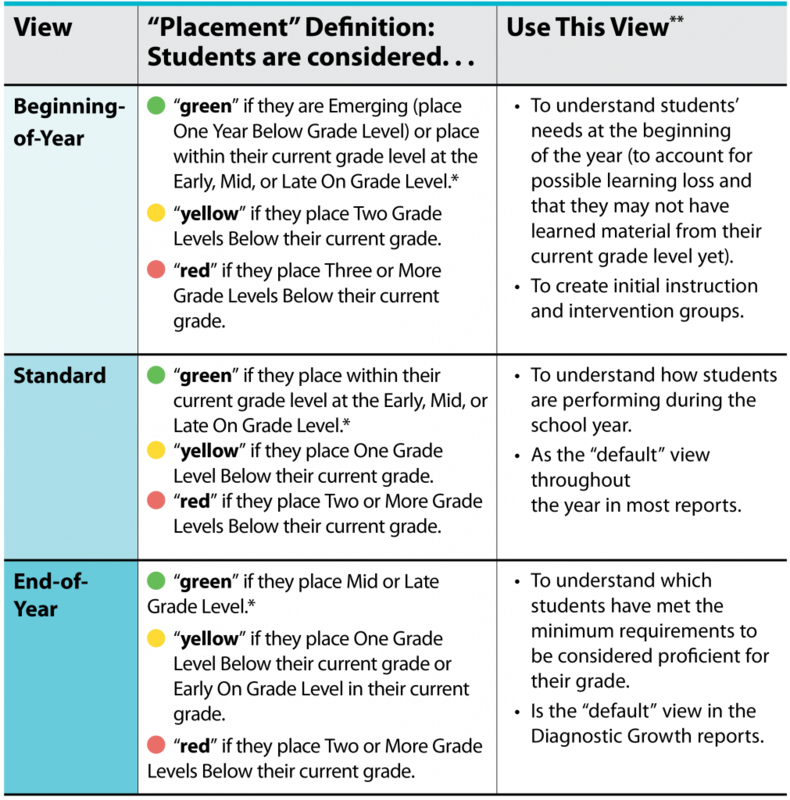 FAQ: Which Placement Definition should I select? When choosing your report criteria for the Diagnostic Status, Diagnostic Results, and Diagnostic Growth reports, you are asked to select the “Placement Definition” for your students. This feature gives you the flexibility to define what it means for a student to be considered On Grade Level, or “green.” As you choose, you can consider how learning progresses throughout the year (i.e., in the beginning of the year students have not been exposed to grade-level material yet). Student scale scores, placement levels, and growth measures do not change, regardless of what view you use, but how students are categorized and color-coded in your report does change. * “Green” also includes students who are performing Above Grade Level. ** When comparing two or more reports, it is very important to make sure you have selected the same Placement Definition for every report. Beginning-of-Year and Standard View: Michael’s score will be considered On Grade Level and his score will be shaded green. End-of-Year View: Michael’s score will be considered One Grade Level Below and will be shaded yellow. Want to print this FAQ? Download a printable PDF.